1. These regulations may be called the Pension Fund Regulatory and Development Authority (Exits and Withdrawals under the National Pension System) (First Amendment) Regulations, 2017. 2. These shall come into force on the date of their publication in the official gazette. (l) The expression “defer” or “deferment” wherever used in these regulations shall mean the postponement or deferment of claims for receiving benefits admissible to a subscriber upon exit from National Pension System. (b) living dependent father of the deceased subscriber . (j) With respect to settlement of claims arising out of the accumulated pension corpus of deceased subscribers, where no valid nomination as specified in these regulations exist on the date of death, the Authority may issue suitable directions in the interest of subscribers for settlement of such claims in favour of the family members of the deceased subscriber, up to a specified limit, by requiring such heirs to submit such documents as may be specified. 9. Withdrawal process.- (1) The National Pension System Trust or any other intermediary or entity authorized by the Authority for the said purpose shall be responsible for processing, authorizing and approving the withdrawal and exit claims lodged by the subscriber in accordance with the provisions of the Act, regulations, directions, guidelines issued by the Authority and the Pension Fund Regulatory and Development Authority (National Pension System Trust) Regulations, 2015, where applicable. The National Pension System Trust shall frame and issue suitable operational processes including online processes or guidelines including the exit or withdrawal forms for facilitating withdrawals and Exit of subscribers from National Pension System after taking due approval from the Authority. 37. Stoppage of last month’s deductions by employer.- The monthly contribution consisting of both the employer and employee, as may be applicable and that is required to be deducted for crediting to the subscribers account under the National Pension System by the employers from the salary of such subscriber shall be stopped at least one month prior to the date of superannuation. The employer shall pay such eligible contributions directly to the employee subscriber along with the monthly salary or remuneration that such subscriber is eligible to receive from the employer. 39. Power of the Authority to issue directions and clarifications.-(1)The Authority shall have the power to issue necessary directions, restricting the provisions relating to withdrawals and exit, as the case may be, under these regulations for complying with any requirements to move from any other pension or superannuation schemes or funds to the National Pension System. 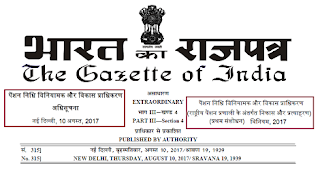 The Pension Fund Regulatory and Development Authority (Exits and Withdrawals Under the National Pension System) Regulations, 2015 were published in the Gazette of India on 11th May, 2015 vide No. PFRDA/12/ RGL/139/8.